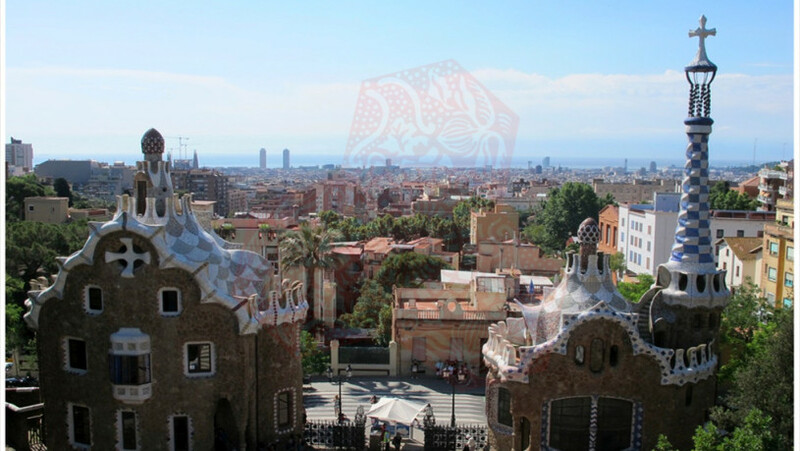 Park Güell contains many instances of Gaudí´s style at the last part of his career: sinuous, sculptural forms; the use of “skins” of tile fragments; and the leaning columns, for example. On the other hand, the eclectic mixture of historic styles that is evident (elements of: Catalan Romanesque, Baroque, Greek Doric, pre-Roman…) harks back to the architect´s first constructions. Gaudí, like other Modernist architects, gained considerable pleasure from the contrast afforded by the different textures and different colours of building materials and this is a basic characteristic of Park Güell: broadly speaking, half is covered with shiny, colourful tile fragments and the other half by dull, brown, rough stone, not counting the smooth grey of the Greek columns. The entrance area, at the lowest portion of the property and bordering on the houses of the adjoining neighbourhood, consists of a long wall with the gate and the two gate houses in the middle. 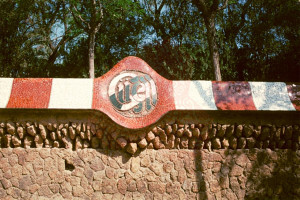 In a similar fashion to the gate houses, the lower part of the wall is covered by rough stone that came from the site, while the curved crest is decorated with alternating red and white bands, formed of shiny fragmented tiles, which are interrupted by medallions bearing the name of the development. Possibly, the medallions have the form of cigar bands in reference to the tobacco investments of Güell, and of his wife’s family, in Cuba and the Philippines. The original gate was a simple wood affair. This is unexpected given Gaudí´s great talent for creating works of art out of forged iron. Long after Gaudí had died, in 1965, the wood was replaced by part of the gate he had designed around Vicens House which was being dismantled to make way for apartment buildings. This is an attractive forged iron structure based on the repetition of the leaf of the European fan palm, a small palm tree found in Catalonia. Upon entering the development, the gate-keeper’s house stands on the right. He and his family actually lived in this wild building. The ground floor contains a vestibule, a dining room, living room and kitchen. Upstairs there are four bedrooms. The attic comes with two balconies while a spiral staircase leads up to a balcony surrounding the central tower. The tower serves as a ventilator to provide air for the attic. The smaller administration building had a large reception room on the ground floor. Furnished with a telephone, residents would have been able to meet their visitors here. On the second floor there are more rooms, one of which is circular, and two balconies. The shorter of the two towers provides ventilation. The two buildings share common characteristics, the most obvious being that Gaudí used rough local stone for the walls and covered the roofs with shiny tile fragments. The balconies have battlements for railings—battlements were typical of several of Gaudí´s buildings—while the sculpted ventilation towers are capped by what many believe to be red mushrooms—possibly of a type that produces hallucinations. Fascinating are the dizzying patterns on the roofs that imitate the movement of drops of rainwater sliding down the slope. The lines of dots that garnish some of the battlements, as well as some of the windows and elsewhere, reinforce the childlike and festive ambience. There is writing on this building (“Park Güell”) and, also to be expected, Christian symbols: large white crosses over the attic windows of the gate-keeper’s house and a cross at the top of the tower of the administration building. The broad window in the latter that looks over the entrance plaza and staircase has a superb forged iron screen, reminiscent of an insect’s eye perhaps, and one can see, in this window and in both entrance doorways, the placement of a single column in front of a door or window that is common in this architect´s buildings. Along the back façade of the gate-keeper’s house, Gaudí placed a urinal which has a cone of tile fragments at the top. The spire of the administration building is 98ft / 30m high. The main stem is covered with a chessboard arrangement carefully placed on the crinkled surface. This spire is topped by open iron work and a four-armed cross in which each arm points in one of the four cardinal directions. Gaudí was once disturbed when he overheard a lady, who was visiting the work-in-progress, exclaim, “I would really like to know what the devil don Antoni plans to do here.” With brows knitted, he pointed to this cross and said, “My dear lady, where there is a cross the devil is not present.” The cross was destroyed in the violence of 1936, at the beginning of the Spanish Civil War. Unfortunately, the replacement is not a good copy of the original. The spire was built using layers of very thin brick. Over time it developed cracks until, in 1952, the brick was reinforced with iron bars. When Eusebi Güell bought this property it was found to contain a number of caves and grottoes. Gaudí was enchanted by grottoes, and he incorporated allusions to them in, for example, Milá House and the Church of the Holy Family.